The National Hemophilia Foundation is dedicated to finding better treatments and cures for inheritable bleeding disorders and to preventing the complications of these disorders through education, advocacy and research. 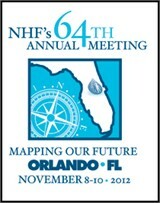 NHF’s Annual Meeting is the largest gathering of the bleeding disorders community in the United States, with more than 2,500 guests attending. It is unique in bringing together not only patients and their families, but healthcare providers, industry representatives, chapter staff and volunteers. The theme of this year’s conference is “Mapping Our Future.” It is an exciting future, with many research breakthroughs on the near horizon. How well do patients follow our treatment advice? Learn about the state of adherence, and a method to help motivate patients to change behavior. Motivational interviewing helps the health care provider lead patients to discover their impetus for change. Learn the science behind the motivational interviewing movement. This seminar focuses on developing practical ethical problem-solving skills for social workers who treat patients with bleeding disorders and their families. Hear about important components of ethical competence, the use of the NASW Code of Ethics, The Ethical Principles Screen, and how to apply an algorithm for resolving ethical dilemmas. We will also discuss the ways that personal values, agency values and the values of the profession intersect in ethical discernment. Lastly, we examine and discuss several case studies that present ethical dilemmas relating to bleeding disorders. Learn about coping with the diagnosis of VWD, management of the disorder and specific challenges it presents during childhood. Includes a brief overview of medication and other therapies for treatment and prevention of bleeding episodes. Learn what to expect during the progression of VWD from infancy through adulthood, the benefits of a team approach to treating physical and psychological aspects, and the services that are available at a hemophilia treatment center (HTC). This session focuses on the basics of hemophilia including inheritance, mechanism, symptoms and management. With a thorough overview of the condition, you will have a better understanding of joint bleeds, the rationale for prophylaxis and practical approaches to common issues. Hear from veteran parents, teens and young adults on living with hemophilia. Hear about strategies to create a secure family environment, despite living with a chronic illness. Learn how to involve other children as part of the treatment team, how to help children understand their sibling’s bleeding disorder and the importance of spending valuable time with each member of the family. Hear how parents can maintain a healthy connection. Learn the strategies to create an environment where all family members can flourish. Piercings, tattoos and gages are often seen as a means of self-expression by many adolescents and young adults, even those with a bleeding disorder. While having a bleeding disorder doesn’t prevent a person from obtaining piercings, tattoos or gages, it does add to the list of considerations to be made prior to making a decision about body art. During this session we focus on safety concerns and precautions, and how peer pressure is related. We learn how to address psychosocial issues common in the adolescent/young adult age group and intervention techniques. This session focuses on stage 4 liver disease (cirrhosis), coordinating liver care with your hemophilia treatment center and the status of new drugs for hepatitis C. We discuss management of complications of cirrhosis, evaluation of orthotopic liver transplantation in a patient with hemophilia and late-breaking hepatitis C therapies. Learn how you can be your own self-advocate when it comes to care, and what is in the pipeline for the future. Únase a nosotros para esta sesión donde analizaremos la definición médica de hemofilia y la enfermedad de von Willebrand, el manejo de los trastornos y un repaso general de los medicamentos y otras terapias para el tratamiento y la prevención de episodios de sangrado. Habrá tiempo suficiente para preguntas y respuestas. From birth control pills to estrogen replacement therapy, girls and women with bleeding disorders are often prescribed hormone therapy to address their bleeding issues. A panel of healthcare providers explain all available therapies and respond to audience questions. We discuss puberty and hormone therapy/birth control, talking to your daughters about puberty and hormone therapy, and perimenopause and menopause replacement therapy. Learn about the variety of hormone therapies and their pros and cons, and suggestions for developing a plan for your daughter with a bleeding disorder in preparation for puberty. Living with von Willebrand disease (VWD) can be very challenging. During this session, we discuss significant quality of life issues faced by men with VWD. We discuss potential challenges that men with VWD face from birth to senior years. NYLI: Who Are We? What Do We Do? The National Youth Leadership Institute (NYLI) is a leadership training program for a diverse group of young women and men affected by bleeding and clotting disorders, ages 18-25. NYLI was created in 2004 to foster the development of leaders and help NHF chapters/associations across the country build strong youth programs. During this session you have the opportunity to meet a few members from NYLI. Learn about different projects they have been involved in over the past year and the application process. Members will highlight their experiences at NHF events, including Washington Days, Youth Fit, and serving as representatives on the NHF Board of Directors, Diversity Outreach Working Group, Steps for Living Task Force, and Annual Meeting Planning Committee. Technology has made it possible to genotype, or determine genetic mutations, for people with hemophilia A or B. Find out about NHF's genotyping initiative that is set to launch in 2013. Find out where NHF and its chapter network are headed, and how you can be a part of something bigger than yourself. Social media offers the opportunity to “meet” others with your rare disease, to relay experiences and search for answers for those difficult questions. The potential is endless! But how much is too much? The collection of personal data is a real danger. While it is important to decipher inaccurate information from unverifiable sources, social media is the reality of our time. We discuss the role social media plays in the bleeding disorders community, the importance of privacy and the benefits of being online. Over the next few years, we will see a revolution in treatment not seen since the 1960s. Treatment products will advance on all fronts, from viral-inactivated (solvent detergent) cryoprecipitate, biosimilars of current therapies and treatment products with substantially enhanced efficacy to the increasing likelihood that through gene transfer a “cure” may become a reality. The blood safety concerns of the past have been replaced by current concerns about maintaining vigilance against such blood-borne agents as viruses and prions. Equally important are the challenges of adequate factor supply and access to products around the world. This session describes how patients have started to join forces to bring all key stakeholders together to ensure that the views of product users are considered when it comes to access to these vital therapies. During this session we also address the challenges of answering US government and payer demands for evidence-based medicine, and cost justification for the introduction of new therapies and enhancement of current treatments. This session introduceS an innovative partnership of the National Hemophilia Foundation (NHF), American Thrombosis and Hemostasis Network (ATHN), Puget Sound Blood Center (PSBC) and Biogen Idec Hemophilia, which offers free or low cost genetic testing and analysis to patients and members of families with hemophilia while advancing scientific research of genetics and hemophilia. The founding partners and other representatives of the community participate in an interactive panel discussion, provide an overview of genetic testing and its value, as well as present details about the new program and how it can benefit patients, carriers, and their families now and for generations to come. This session reviews current research on prevalence and impact of overweight conditions in patients with bleeding disorders. We analyze the biomechanical stress of weight loading on joints and multiple body systems, and will review how being overweight adversely affects people with bleeding disorders even more than the average population. Examples of calculations for biomechanical stress are given. Research on weight-loss strategies will be reviewed and participants will develop at least one strategy for counseling/patient education, safe exercise for fitness, wellness and weight loss, motivation and promotion of self-management. Dr. Kisthardt draws upon his research with treatment providers in 42 states relating to effective interventions with participants who struggle with dual or multiple diagnoses. This workshop is informative and interactive. The four essential components of the approach – Engagement, Strengths Assessment, Personal Wellness/Recovery Planning and Group Supervision – are explored. This session provides a general overview of teenagers’ physical attributes, changes and challenges in sports training and participation. Hear about the need for communication between parent, coach and athlete for frequency and intensity of workouts. Be educated on the need for incremental and stair step training. This session also provides education on the complications rapid teenage growth spurts add to the joint control and strength. This session also hosts an open forum discussion related to the clinical decision-making process of healthcare professionals regarding participation in physical activity and sports. Challenges faced in this process including economic and financial considerations and quality of life will be included. It will identify and explore questions and areas of concern and raise awareness of important factors to consider beyond the more apparent physical risks and benefits when advising patients about sport participation, and discuss and document concerns faced by healthcare providers for further exploration. This session helps clinicians to counsel parents whose chronically ill children are exhibiting difficult behaviors. Factors that contribute to difficult behaviors will be reviewed. The importance of helping parents identify priorities for behavior change is emphasized and strategies for counseling parents to help their children increase desired behaviors are described. This session is a review of current factor products and antifibrinolytics. It includes a review of factor products on the market today with a discussion and comparison of their molecular structure, FDA-approved indications, half-life, storage requirements and reconstitution devices. We also present a review of antifibrinolytics, including the use, dosing, FDA-approved indications and contraindications. In this session, we discuss safety equipment for daily activities for children with bleeding disorders and the ability of safety measures to ultimately prevent bleeding episodes. We focus on the pros and cons of protective equipment and how to make the best decisions for your family using MedicAlert® guidelines. How important is MedicAlert identification? What is the best safety plan for your child? Can bleeds be prevented? Listen and find out! En esta sesión, nos concentraremos en cómo la cultura afecta a las familias con una enfermedad crónica y cómo superar el estigma de un trastorno de hemorrágico para que no afecte a su hijo. Discutir cómo las parejas pueden trabajar juntos como un equipo y involucrar a la familia extendida como ayudantes. Al final de la sesión aprenderá técnicas sobre cómo trabajar más eficazmente juntos como una familia para hacer frente a los estresores de un trastorno de sangrado. This session focuses on health issues that affect older hemophilia patients and the evolving nature of comprehensive care. We discuss cardiovascular disease; rheumatological diseases such as gout, arthritis and bone disease; cancer screenings; and orthopedic referrals. Learn the symptoms of age-associated health conditions and how you can coordinate with your HTC and other providers to get the resources you need. This session is geared toward families of children with bleeding disorders and teens who have either chosen to participate in sports or who have chosen a different interest, such as music or art. We discuss the physical pros and cons of sports and the psychological pros and cons of belonging to a team, including choosing not to participate. During this session we focus on von Willebrand Disease care for a variety of patients seen at the HTC. We address approaches that have been successful in dealing with diverse patient populations and look at unique scenarios. During this session we focus on the evaluation of hemophilic arthropathy of the elbow, including the general signs and symptoms, the physical findings, the evaluation tools and the medical and surgical treatment options. Special emphasis is placed on the evaluation of the available imaging tools (radiographs, ultrasound, CT scan, MRI) and on the available surgical options for advanced hemophilic arthropathy of the elbow. Nonsurgical alternatives are discussed. This session focuses on the role and importance of historical and contemporary social statuses that shape medical and public health professional individual and institutional practices with African-American males. We explore how these racialized and social class experiences, coupled with American male cultural notions and experiences with public and private social welfare and social service institutions as both patients and clients, frame the context for examining African-American male marginalized engagement and their subsequent distrust/mistrust of the medical and public health professions. In addition, the presentation focuses on how male help-seeking behavior and culture within the disproportionately impoverished African-American community influence engagement with social welfare and social service institutions. NHF’s DC consultants provide an update on the political climate post election, its potential impact on health reform implementation and what it means to you as a consumer. Learn how to use the Personal Health Insurance Toolkit to assist you in evaluating your health plan options. For female carriers, dropping the term “symptomatic carrier” and picking up the label “mild hemophilia” can be more complicated than it seems. Listen to a panel discussion about the benefits and challenges of labels. Topics include implications of labels and diagnosis in terms of insurance, medical care and self-identity. In this session, we focus on the role spirituality has in our healthcare decisions. We discuss the definition of spiritual diversity, the ways in which to work with healthcare providers while staying true to beliefs, and your rights to spiritual sensitivity in the healthcare setting. Learn that spiritual diversity can impact your healthcare decisions in a positive way. In this session, we focus on the variety of healthcare providers families with a bleeding disorder will encounter and give effective methods on how to best communicate with them. We define “need to know” information and role play an exercise on how to effectively advocate for your care when dealing with different providers. Leave the session with a list of phrases that will aid in conversations with healthcare providers and a basic template of “need to know” information. Best of all, you will have increased confidence in working with your healthcare team. As a caregiver, do you ever experience burnout or loss of identity? During this session we focus on caregiver identity, how relationships are affected by the caregiver and the importance of maintaining balance in multiple roles. We look at research findings about caregiver identity and hear anecdotal experiences from our panelists. You learn ways to monitor caregiver burnout, and get suggestions and tips on maintaining balance and nourishing healthy relationships. In this session we focus on the biomechanics of sexual activity for individuals with chronic pain and/or limitations in joint function due to bleeding disorders. We discuss possible expansion of one’s view of sexuality, principles of positioning to promote intimacy and comfort, and pros and cons of common positions assumed during physical intimacy. We list options for intimate exploration, describe three principles of optimal positioning and at least two methods of modifying posture to increase comfort while participating in intimate activity, and describe potential benefits and drawbacks to common positions assumed during intimate interaction. During this session the audience learns about complementary and alternative medicine (CAM), including the most common CAM practices in the USA and their costs. Learn about the effects and mechanism of action of the most popular herbs and how they can affect individuals with bleeding disorders. The role of healthcare providers and CAM is also discussed. Learn about Steps for Living, NHF’s newest educational program! The Steps for Living website is a great resource for information on bleeding disorders for kids, adolescents, adults and health educators to promote healthy living for the whole family. It’s a practical tool kit to help families deal with the daily challenges of living with a bleeding disorder and make healthy decisions throughout all life stages. Steps for Living is composed of four sections: First Step, ages 0-8; Next Step, ages 9-15; Step Up, ages 16-25; and Step Out - a new section for adults 26 and up. NHF Ethics Committee: What Can We Do For You? Listen as we uncover some of the rarer bleeding disorders. We discuss the signs, symptoms and mechanics of the disorders; available treatments; and issues faced by patients. There are many different perspectives on living with a chronic illness and many reasons to be optimistic. During this session we focus on finding balance in your life, and finding ways to develop your natural skills and abilities. We look at healthy ways to integrate your bleeding disorder with your identity and hear from others who have used their skills in creative, fulfilling ways. Your bleeding disorder is only one part of who you are. Learn how to develop your whole person and tap into your many talents. This session will teach you the definition of telemedicine, and describe the role of the originating provider and the distant provider. Be able to describe how telemedicine can be used in the research role. Prevention of joint bleeding to protect structures such as the synovial membrane, cartilage and bone from detrimental changes is optimal, but not entirely feasible at this time. Therefore, we frequently must rely on medical and adjunct treatment administered at the time of bleeding to minimize the negative effects of blood in the joint. Advances in treatment that healthcare providers are able to offer people with hemophilia begin with basic science. In this session we discuss multiple concepts taken from scientific research that may influence future clinical practice and our ability to affect inflammation, wound healing, synovitis, cartilage and bone, and minimizing the negative effects of blood in the joint. During the session we focus on the role of the social worker in pain management of people with hemophilia. Program participants review research and literature findings on cognitive therapy and mindfulness-based stress reduction (MBSR) and their use as direct interventions with clients in pain. Experience second hand MBSR techniques and tools, and how to expand clinical skill sets for treatment of pain. A panel of young adults with bleeding disorders share childhood experiences of their parents’ adjustment to their diagnosis. We discuss the challenges a bleeding disorder can present, as well as the growth that can occur in both parents and children as a result. This conversation for all will reassure new families that life with a bleeding disorder need not be as frightening as the initial diagnosis. Many women with bleeding disorders have experienced the frustration of missed diagnosis, the physical and emotional pain of untreated bleeding conditions, and the embarrassment of disclosing personal information in order to explain why they are not feeling well. For some women, there is also guilt associated with passing a genetic condition on to their children. This session provides a time for women to reflect on their feelings about their lived experiences with bleeding disorders or those of their loved ones, and learn about various techniques for coping. Come for a taste of PEP. This special session is designed to strengthen parents who have a child with a bleeding disorder. While addressing the physical and emotional issues related to raising a child with an inherited, complicated bleeding condition, participants strengthen their behavioral management and communication skills. The session is taught by a trained PEP team including a parent peer, nurse and social worker. This session reviews how FVIII and FIX carriers are identified, and explores the latest information on related bleeding manifestations. The importance of identifying and managing anemia related to blood loss will be included. Additionally, the effects of aging and related factors on FVIII levels, including the importance of FVIII’s role in thrombosis, is presented. Art or Science: You are the PT. You know anatomy and kinesiology. You know the basic pathophysiology of hemophilia. But what recommendations will you provide for the person with a bleeding disorder who is sitting in front of you? RICE? Don’t participate in collision sports? This session focuses on what we know, what we think we know, and what we hope we know about an evidence-based approach to the musculoskeletal management of persons with bleeding disorders. This session reviews hemophilia pain and how it may be perceived. We look at data from the National Pain Study and discuss non-pharmacological approaches to pain management with an emphasis on collaborating with your hemophilia treatment center for optimal pain management options. We learn to recognize the many different types of hemophilia pain and understand how different non-pharmacological strategies can assist in pain management. In addition, we identify how teens may differ in their expression of pain. This session focuses on education and information about illicit and “street” drugs that are commonly abused. We discuss the different names, types and components of “street” drugs and illicit drugs. Drug side effects and possible symptoms or warning signs of abuse are elaborated on. Learn about how common household items and normally prescribed drugs are being abused by both youth and adults today. Do you want to be a doctor, lawyer, artist or professional athlete when you grow up? Let us tell you how. Hear a discussion on planning for your future, resources that are available, and how to advocate for yourself and take personal responsibility. We focus on scholarship opportunities and grants, the importance of career and personal inventories, the importance of class selection and performance, and hear success stories from our panelists. Learn how to use Internet and college search engines, the importance of the Free Application for Federal Student Aid (FAFSA) and the role that vocational rehab can play. Understanding Hemophilia Genetics: How Can We Help? Social Workers are given an introduction to basic hemophilia genetics, including pattern of inheritance, risk determination, and molecular testing and analysis. Using case scenarios we discuss the implications of DNA testing on the patient and family, and the complex ethical issues surrounding the disclosure of results. We explore the psychosocial dynamics of the burden and consequences of genetic knowledge. Participants identify and explore ways to assist patients and families cope with the all-too-common reactions of guilt, shame and blame —— Career Counseling for Adolescence: During this session we focus on the role and importance of career counselors within the bleeding disorder community. We discuss advocacy skills for parents and students, the differences between Healthcare Plans, IEPs and Section 504 plans and when each plan should be appropriately used. Learn about the importance of early career testing, scholarship searches, and school/community involvement activities. —— Utilizing Telemedicine in Rural Communities: This session focuses on implementing a telemedicine program at your HTC. We discuss funding, the protocols and technology necessary to run such a program. Learn how this innovative technology can improve access to healthcare and quality of care for the rural patient population. You also learn how to assess client readiness and delivery of social work intervention techniques using telemedicine as a therapy tool. Learn about the Scandinavian Total Ankle Replacement (STAR™) from the Medstar Georgetown University Hospital's leading foot and ankle surgeon, Paul S. Cooper, MD. Dr. Cooper discusses ankle anatomy; what makes the bleeding disorders patient an ideal candidate for the STAR; the advantage of ankle replacement over an ankle fusion; and preoperative, post-operative and rehabilitative care. He talks about how bleeding disorders patients are doing and will be expected to do in the future. Having performed more than 1,000 ankle replacements, Dr. Cooper shares his experience, challenges and hopes for the future of ankle replacement therapy. This session focuses on the role of the HTC nurse in the camp setting. After a brief discussion of the history and types of camps offered for those with bleeding disorders, the speakers focus on the following: health center guidelines developed for camps serving those with bleeding disorders; ways to address campers' other co-morbidities besides their bleeding diatheses; and the benefits to both the HTC nurse and the camper in this type of setting. We also discuss the importance of self-infusion teaching and ways to accomplish this at camp, the importance of teaching within the camp setting, how other health-related topics that support the care of children with bleeding disorders can be incorporated at camp, and ways to make the learning experience fun. Medical Marijuana: What’s It All About? During this session we discuss the evolution of marijuana as a medical strategy for symptom management. We review the history of medical marijuana, look at the challenges and barriers in using it for medical purposes, and discuss its effects on the body.